With the recent resignation of Kristyn Econome from the Board of Education, the Cañon City School District is seeking persons interested in filling her seat for the remainder of her term, through November 2019. Colorado law (C.R.S. 22-31-129) says a board of education has 60 days to appoint a qualified person to fill such a vacancy. Due to the weather conditions, there will be a two hour delay on Monday, October 15th, 2018. 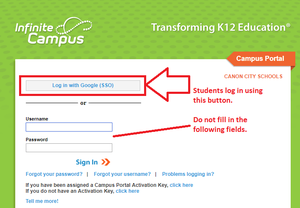 We are still working on configuration problems with the Campus Portal App and Google Single Sign on. Thank you for your patience! Now you can pay Fees Online! Online Pre-Registration and Campus Portal will not be available on Thursday, July 19, 2018. Due to a server hosting change, Online Pre-Registration and Campus Portal will not be available on Thursday, July 19, 2018. Due to the unavailability of accessing the system, the District Administration Office will not be assisting with pre-registration on Thursday. Assistance will resume on Friday, July 20, 2018. We apologize for the inconvenience. Due to a water outage there will be no summer meal service July 5th and 6th and our summer meal program will move to Canon City Middle School - 1215 Main St. starting July 9th. Please enter through door 25 on the south side or door 21 on the north side at CCMS. We look forward to seeing you there! Cañon City School District no longer requires media release permissions be completed during the student registration process. As a public school district, we cannot guarantee that media outlets will not release photos of our students. If you have a specific concern regarding this policy and your child, please communicate with the principal at your child(ren)'s school(s). 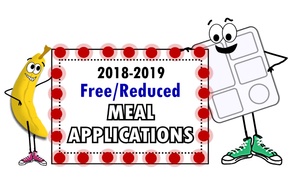 2018.19 Free and Reduced Meal Applications Are Now Available. Download from our website, pick one up at our Summer Meal Program or at our Administration Office. Applications will also be available at school registration in August. 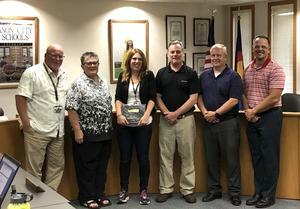 Congratulations to Canon City Schools Fremont RE-1 and Colorado Springs School District 11, winners of the U.S. Department of Agriculture's 2017 GOLD Turnip the Beet Award!